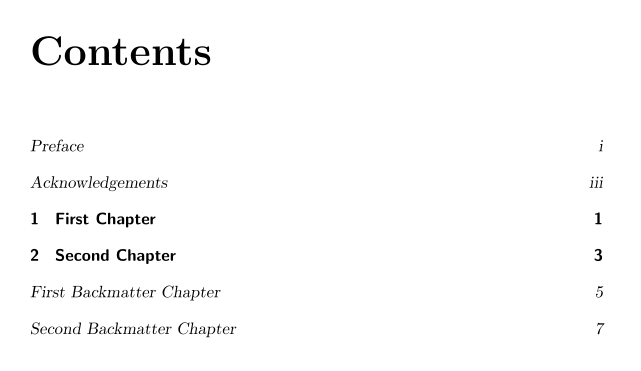 I am looking for a way to make both frontmatter and backmatter chapters non-bold italic in the Table of Contents. It uses the tocloft package and its commands \cftchapterfont and \cftchapterpagefont. My question is how to extend this to work for the backmatter chapters too? Here is another suggestion using package tocbasic. Not the answer you're looking for? Browse other questions tagged table-of-contents formatting tocloft or ask your own question. How to change the style of ToC and \chapter? Using scrbook, how to suppress page numbers for all but several chapters in TOC? Include Detailed Contents entry in short TOC?